Every now and then, the sun releases a giant plasma pie towards Earth. These giant, cosmic plasma pies are dubbed as solar flares by astronomers. Solar flares explode into existence from the depths of sun spots. Scientists have been keeping an eye on one particular sun spot since January that was so large, it was capable of traveling around the far side of the sun and makes its way back towards the Earth’s allignment again in early February. Out of this sun spot, the largest solar flare of 2014 erupted into existence this morning at 7:49 pm EST. The sunspot is dubbed the gratuitously banal name sunspot AR 1990. The solar flare that emerged from the depths of sunspot AR 1990 is dubbed as an X4.9-class solar flare. The X in X4.9 is not an arbitrary label. X-class solar flares are the most powerful type of solar flares and are noted for causing geomagnetic storms on Earth. An X2 solar flare is twice as strong as an X1, and an X3 solar flare is three times as strong as an X1. The solar flare released this morning is one of the strongest solar flares to emerge during this eleven-year solar cycle, shortly following X6.9 solar flare released by the sun in August 2011. 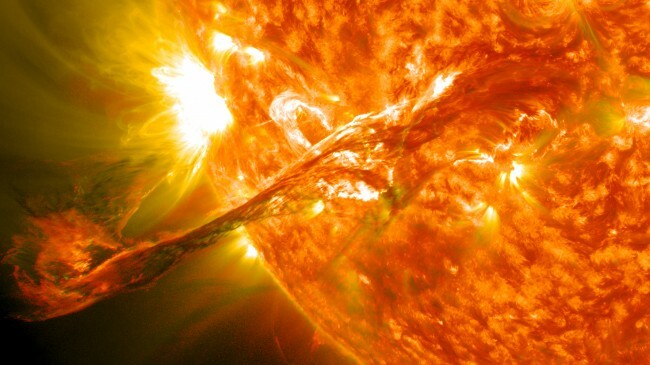 Scientists refer to an explosion on the sun’s surface as a coronal mass ejection. The coronal mass ejection occurred shortly after the solar flare this morning, projecting a host of magnetic fields into the vacuum of space at velocities roughly 2,000 kilometers per second. A coronal mass ejection released at those speeds could cause damage to satellites. Luckily, the coronal mass ejection was not directly aligned towards Earth. Plasma unleashed by a coronal mass ejection is referred to as a fourth state of matter by nuclear physicists. The plasma released by a coronal mass ejection is also responsible for the famed aurora borealis. The plasma consists of negative and positively charged particles. These particles break apart when they come into contact with the Earth’s magnetic field, spiral down its poles and wither a glow. This is why the aurora borealis are best viewed in the north. As referenced earlier, the solar flare released this morning does not pose a threat to Earth. Scientists have been holding their breath during this eleven year solar-cycle. A solar cycle is a process that occurs every eleven years whenever the sun’s magnetic fields gradually flip. The sun slowly winds up like a clock and sporadically unleashes bursts of plasma. If solar flares are projected towards Earth, they can cause a disruption in satellites and technological communication. The current solar cycle that we occupy was stronger than scientists had originally expected and had the potential to cause these disruptions. The strongest solar cycle to pose a similar threat occurred in 1859, when satellites were non-existent. However, in contrast to the solar cycle in 1859, the current solar cycle has been remarkably week. Accompanying these unexpected predictions is the stark reminder of how little we still understand about around closest neighboring star, the sun. 4 Responses to "Giant Solar Flare Released by the Sun"
Gotta love a good solar flare, doncha? Here is a quote from the article “Giant Solar Flare Released by the Sun” (Added by Nathan Cranford on February 25, 2014). Is this supposed to be 7:49 AM or PM….EST?